After picking up my nephew at his school, we ran into a threatening storm as it started to rain on the way home. My nephew, being seven years old, said: "it is raining dogs and cats." I laughed at this expression and told him "it is only raining cats right now." He glanced out at the sky and asked: "why? Is it because dogs are heavier?" I had to agree happily with this metamorphosis. The mind of a child amazed me at times. My nephew went on to say rain is good for the earth and makes everything grows. I interrupted him and told him that the rain is not good for my body. Again, my nephew declared: "because you are old, and you need help!" I came to a stop in this argument, and thought how true his words were. 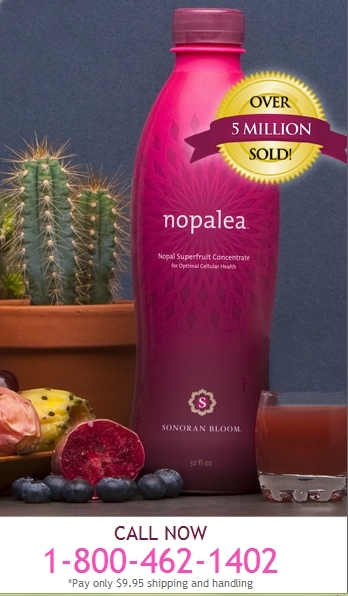 Maybe I should take a leap of faith, get a FREE bottle of Nopalea wellness drink by calling 1-800-462-1402, and just pay $9.95 for shipping. After all it has sold over 5 million bottles worldwide. Having a conversation with a little kid is refreshing some time!